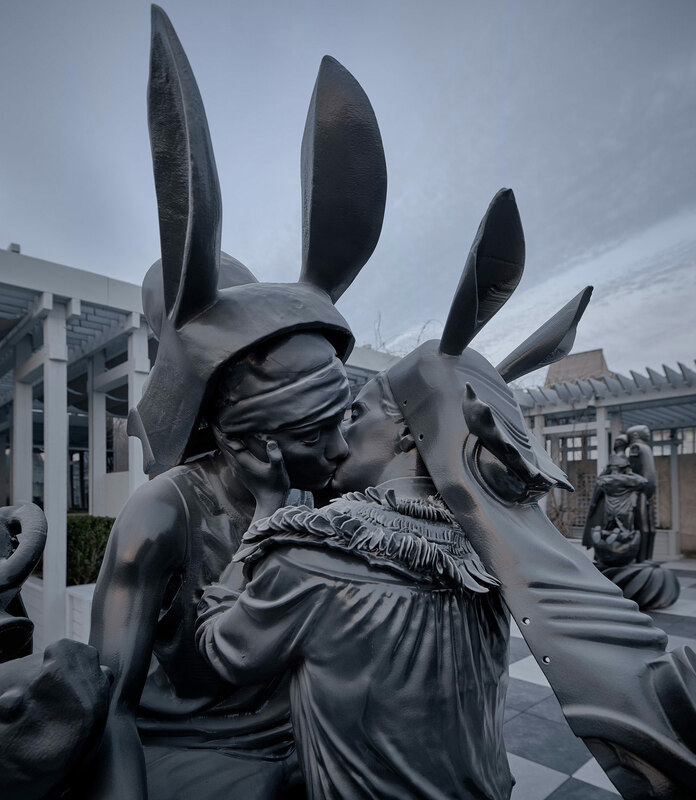 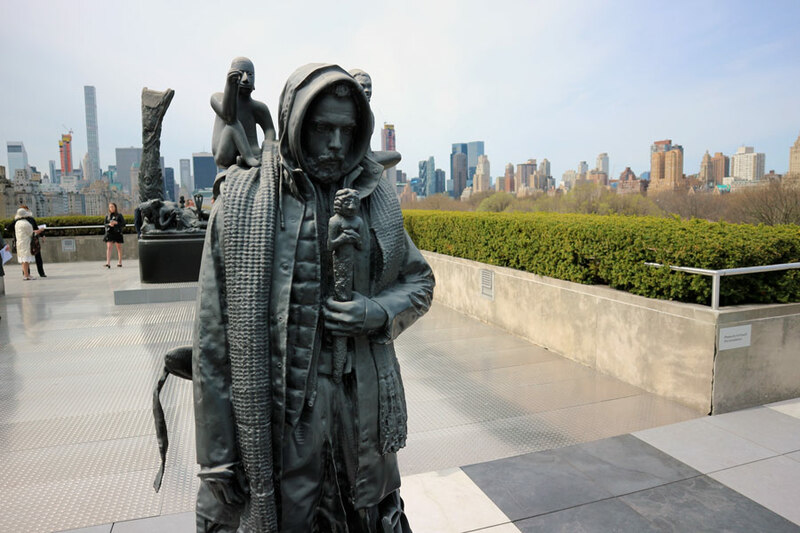 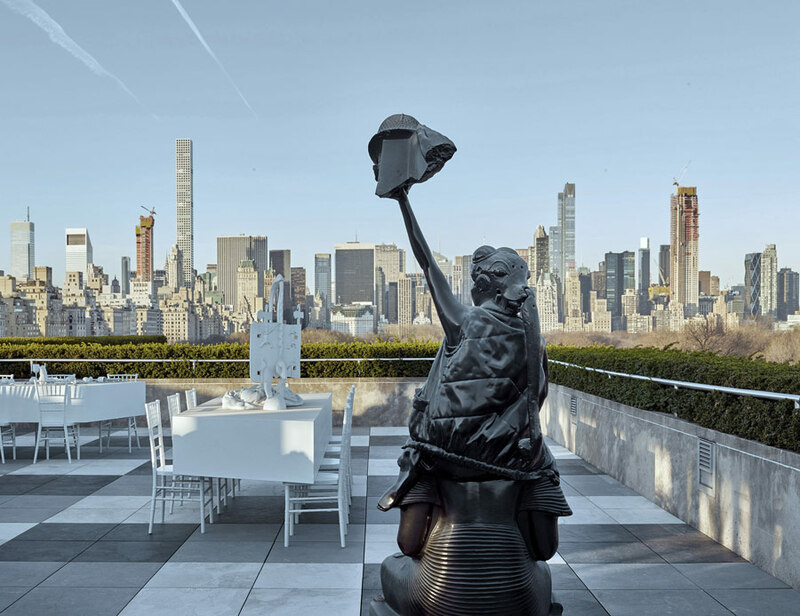 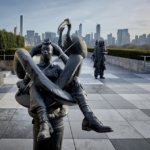 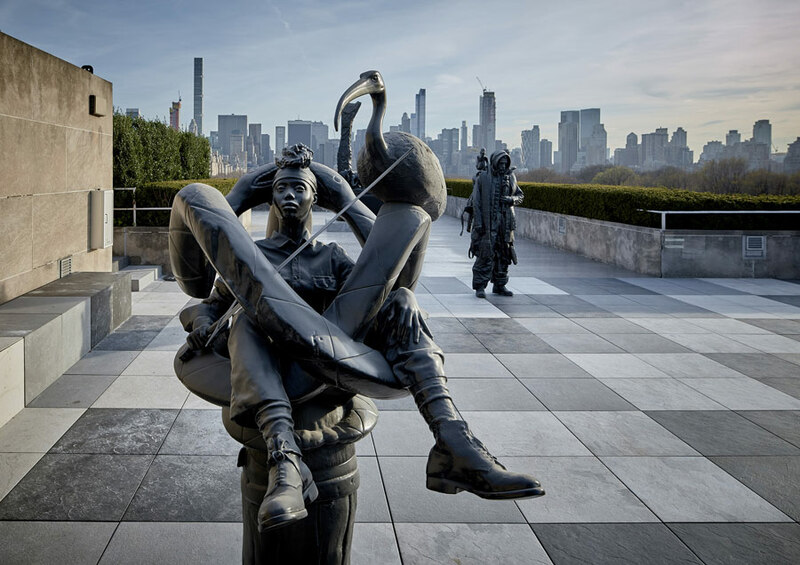 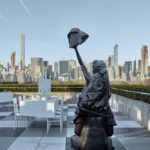 Spring is finally here, and sure as daffodils, new art has sprouted on the rooftop of The Met. 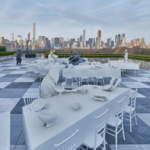 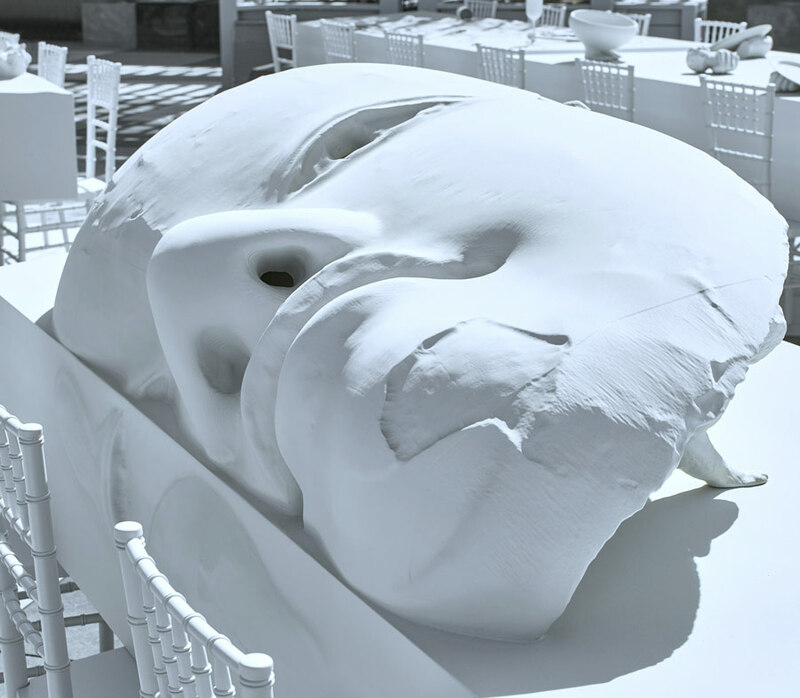 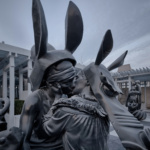 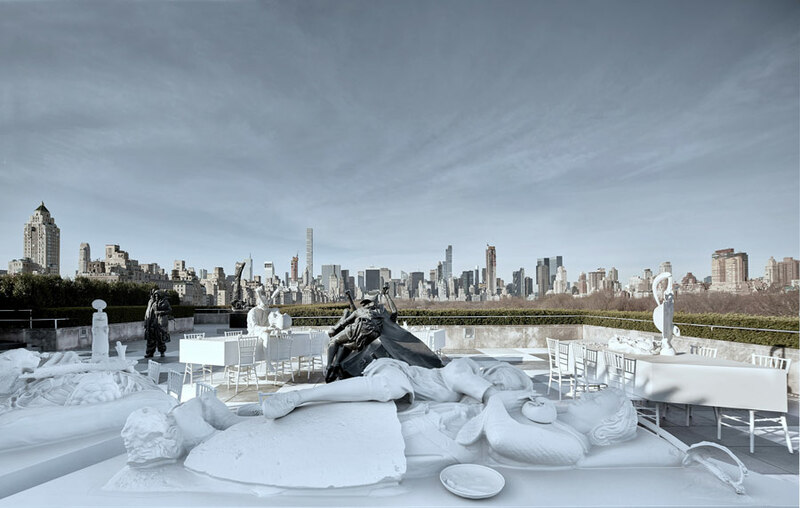 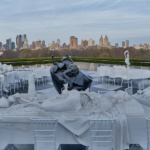 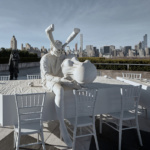 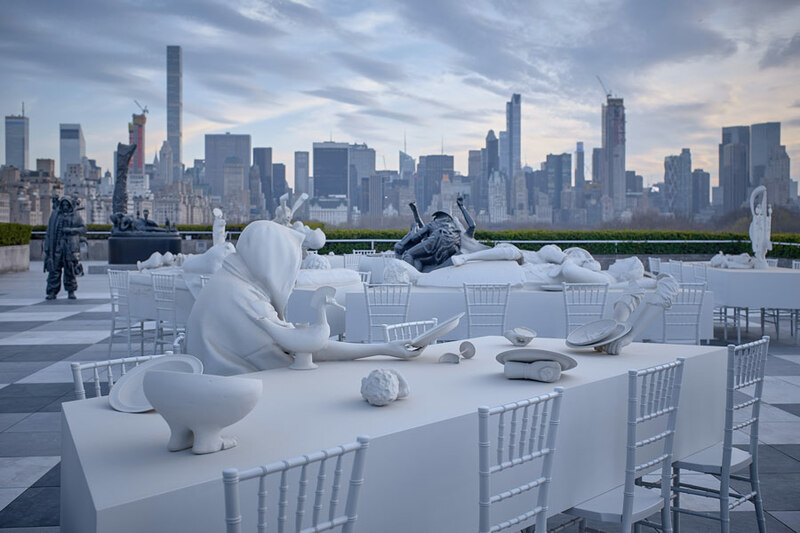 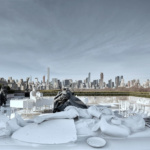 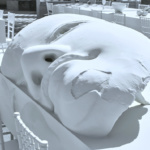 Last year, Cornelia Parker enlivened the roof with a creepy house, and this year, Argentine artist Adrián Villar Rojas has created The Theater of Disappearance, a surreal dinner party that questions how cultures are presented and objects contextualized in New York’s largest encyclopedic museum. 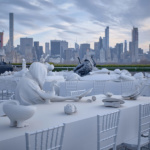 Among the sculptures, there’s a lot to catch the eye: At one table, disembodied arms make owl eyes over a figure who’s contemplating a shapely object in his own hands. 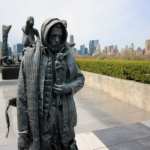 Behind that, a backpacker stares wearily into the middle distance, holding a figurine with two others on his shoulders who seem to be standing guard. 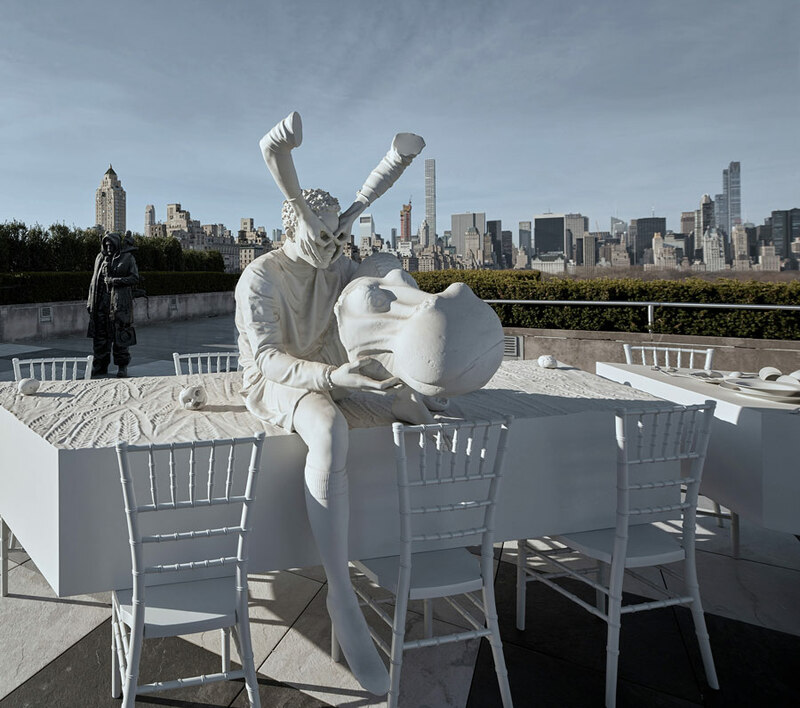 There are art experts who could easily identify the artifacts Rojas used, but The Theater of Disappearance is more about the radical juxtaposition of the objects, their decontextualization collapsing history and human culture into one exuberant tableau. 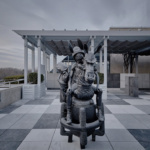 To develop the works, Rojas spoke with curators, researchers, conservators, and others in charge of specific collections, scanning suits of armor, Egyptian, Greek, and Roman art, and carved figurines from the Americas. 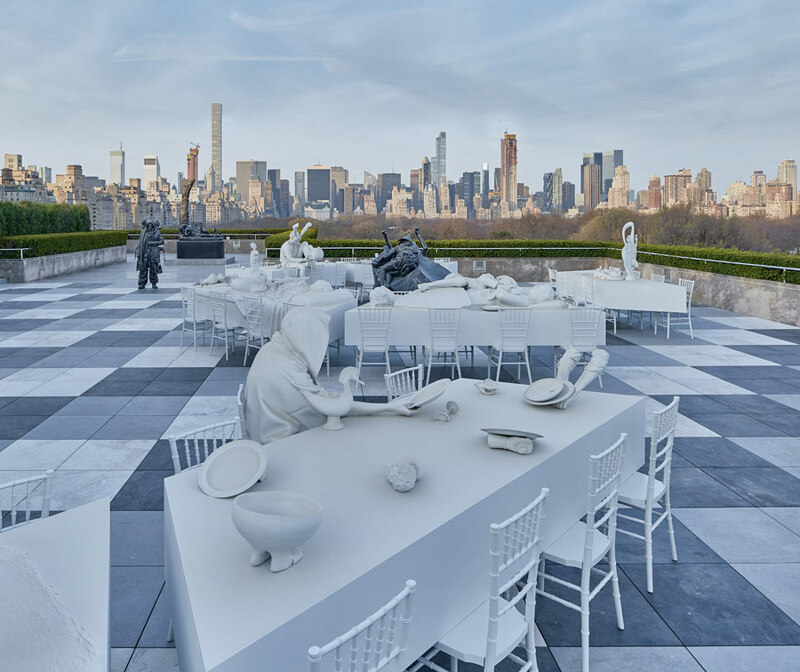 There are almost 100 objects re-collaged among body scans of real, contemporary people—work boots and puffy vests and canvas sneakers and all. 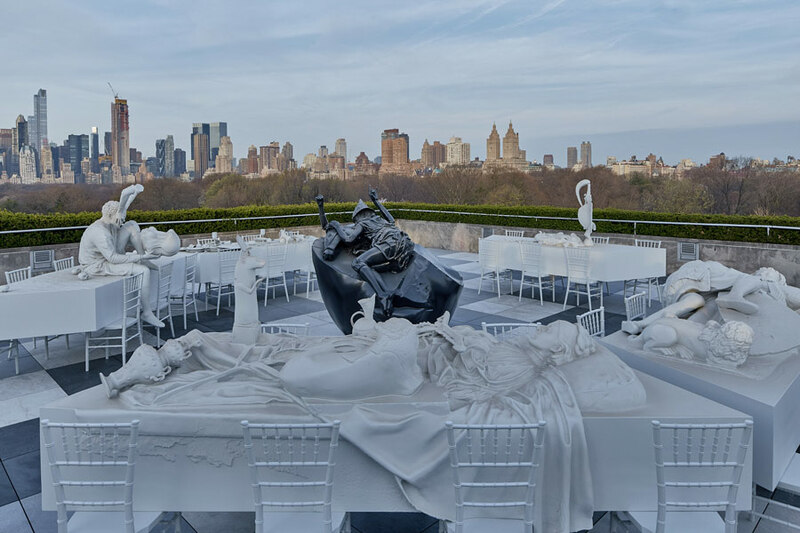 Beyond sculpture, the artist designed the outdoor space down to the very last detail. 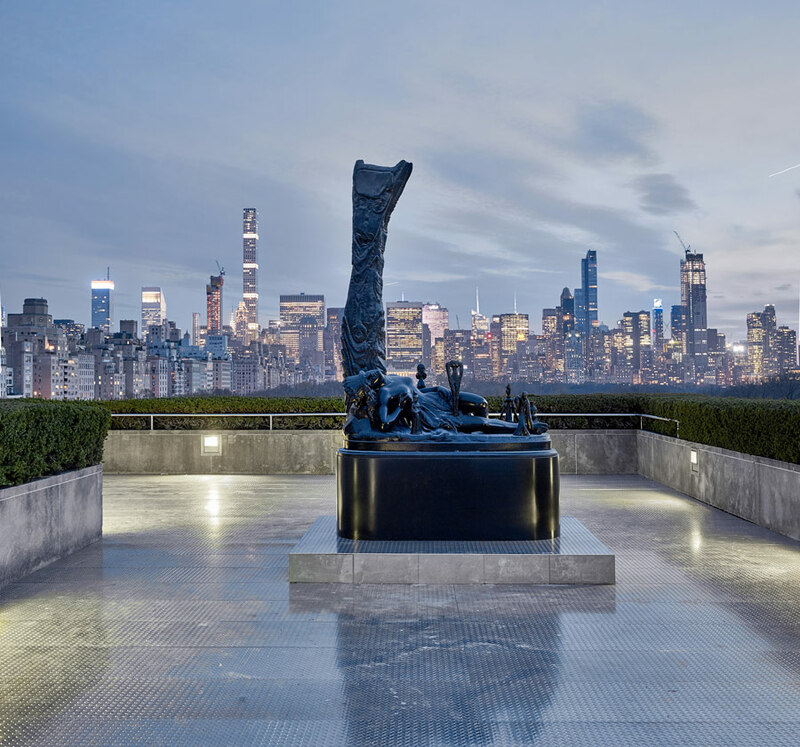 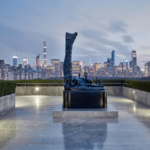 He collaborated with the museum on a new bar and extension of the pergola, new benches, plantings, as well as a patchwork gray stone patio and an industrial hatched-metal floor near the rear of the terrace. 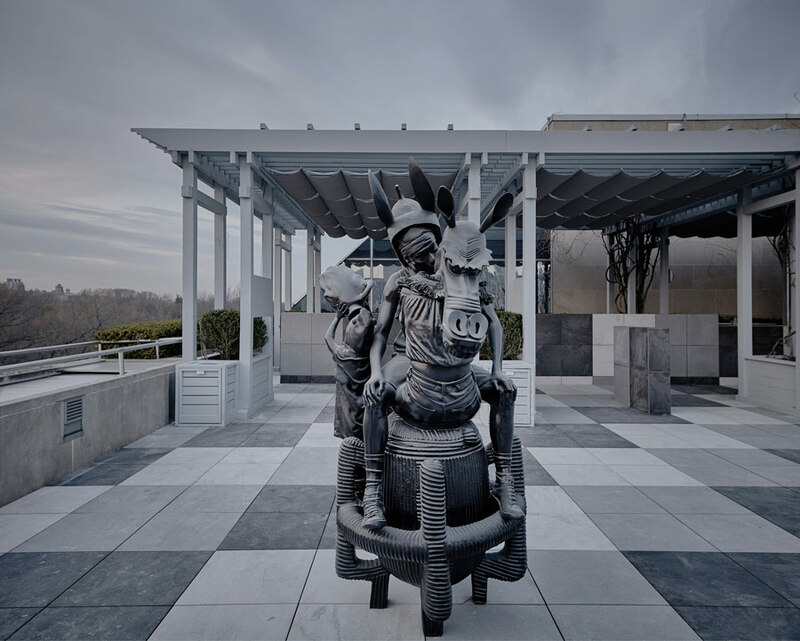 The typeface for the exhibition, and wayfinding signage on the rooftop, was designed by Rojas, as well, in order to create a completely immersive experience.